Metro Cup Blue University Of Auckland - ubiq bookshop: the best place to buy books! 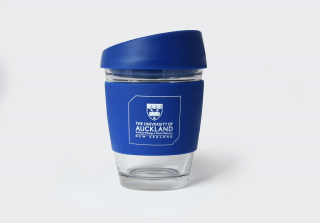 340ml reusable glass coffee cup with a secure push on silicone lid and a wide heat resistant silicone band. Glass is a natural choice for a clean, pure taste and it offers an eco-friendly alternative to single use paper cups. Presented in an unbleached cardboard gift box with a window to show the UoA logo and product care instructions on one side.